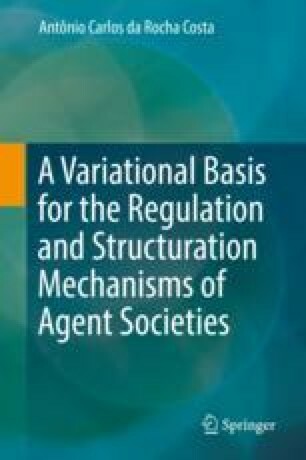 It is clear that this book developed only the very elementary variational basis for regulation and structuration of agent societies. The regulation/structuration model sketched on that basis can be fully developed, in many possible ways, by further work that “fills the blanks” in what was presented or suggested in each chapter. In other words, the basis and the model introduced here are no dogma, and the book is no catechism. the analysis of the possible structure, behavior, and exchanges of the rulers of the various operatory levels of core operatory structures, so that the way they regulate and structurate those core operatory structures can be formally defined. Meanwhile, we expect that the variational basis introduced here can motivate experimental computational realizations of structuration and regulation mechanisms for both core and full operatory structures of agent societies, capable of providing critical feedback on the potentialities and limits of the model.